The national security environment is one of uncertainty and complexity, with security threats emerging from different conflicts and threatening different interests. Despite its relatively remote geographic location, the threat to Australia and Australians from terrorists and violent extremists is both real and growing. Australia has one of the largest and most challenging border environments in the world with approximately 37,000 kilometres of coastline – much of which is in remote regions, eight major international airports, more than 60 international seaports, and an offshore exclusive economic zone covering 10 million square kilometres of ocean. Australia’s Department of Immigration and Border Protection (DIBP) considers the border as a strategic asset, and plays a critical role in national security. The Australian Border Force (ABF), the operational arm of the Department, performs a vital role in protecting Australia’s borders and keeping Australians safe. Established on 1 July 2015, the ABF brings together all of the operational functions of the former Customs and immigration departments. It delivers on regional, national and international border protection, law enforcement and national security priorities, and is strongly committed to staying ahead of the very real and evolving threat of terrorism. 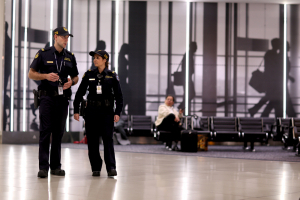 To enhance the capability of the ABF to deal with inbound and outbound national security threats, special Counter Terrorism Unit (CTU) teams are deployed at Australia’s eight major airports. “CTU teams provide a visible and active demonstration of the Australian Government’s commitment to maintaining the integrity of Australia’s borders and Australian law”, said ABF Acting Deputy Commissioner Clive Murray. CTU officers proactively intercept suspicious persons of national security interest in Customs controlled areas. The officers also screen all inbound and outbound passengers, using a range of indicators to determine which passengers they wish to speak to. Since their deployment the CTU has had a real impact at the Australian border. “The CTU has prevented the travel of minors to conflict areas, found evidence of significant movements or attempted significant movements of large sums of cash, and detected images and material of an extremist nature. Some cases have resulted in the suspension or cancellation of passports, and others in the imposition of infringement notices,” said Murray. Since the implementation of the CTU, the teams have undertaken almost 278,000 real time assessments. Such assessments involve the CTU officer asking a short series of questions to determine risk, and then making a decision on whether further action is required including baggage examinations. Additionally, over 19,000 patrols have been conducted, adding to the ABF’s detection and deterrence capability in the airport environment, and supporting the Australian Government’s national security priorities. The ABF’s capability to target security concerns is further enhanced through an Advance Passenger Processing (APP) system. APP has been in place since 2003, and is one of the most advanced border control systems operating today. It operates at check-in to verify if a traveller holds a valid visa or other authority to travel to Australia. In 2015, APP capability was expanded to include outbound information to better understand who is departing from Australia. With this expansion, the ABF now has more time to conduct checks, against alert lists, before the individual crosses the immigration primary line to depart Australia. While protecting Australia’s borders from threats is critical, facilitating the smooth flow of people and goods across the border is also essential to Australia remaining a prosperous and cohesive society. Each year the ABF processes more than 35 million travellers through Australian air and seaports. The total number of international travellers arriving and departing Australia continues to grow on average at about 5 to 7% each year. In December 2015, the ABF saw record numbers of passenger departures, and January 2016 similarly saw the highest number of passenger arrivals. The advancement and investment in technology have provided opportunities to improve how the ABF enables and facilitates its operations. It has increased the Department’s ability to process passengers while upholding Australia’s strict security arrangements. An automatic passenger processing technology called ‘SmartGate’ is now providing a faster and simpler process for travellers while maintaining the security of the border. It performs the checks usually conducted by an ABF officer, and uses facial biometric technology to confirm the identity of travellers. According to Michael Milford, First Assistant Secretary of the DIBP’s Major Capability Division, implementing SmartGate allows legitimate, law-abiding travellers to be facilitated more efficiently and with less manual intervention, leaving ABF officers to focus more effort on traveller interactions, intelligence collection, enforcement, and targeting activity. “SmartGate technology is also critical in improving our ability to accurately confirm the identity of travellers. It can help prevent incidents of people travelling illegally on someone else’s passport —improving both the departures experience for legitimate travellers, and boosting our border security efforts and outcomes,” said Milford. SmartGates are scheduled to be operating in all eight Australian international airports by 1 July 2016, and since the commencement of the project the Department has already seen more than 5.6 million passengers processed using this technology. “It’s about rewarding the good, and ensuring that those who attempt to illegally breach our borders are detected and consequently face the full weight of our laws,” Milford added. The ABF will continue to use and develop sophisticated digitized systems to collect and safeguard duties, and control goods and the movement of people. This coupled with the ongoing investment in training a highly skilled and adaptable task force ensure that the future is positive. In this rapidly changing border environment, Australia’s DIBP and the ABF remain committed to delivering the capabilities required to address threats, and to harnessing opportunities to promote a streamlined and simplified border experience for legitimate travellers.